Two decades ago, this pristine shoreline with the occasional fisherman was transformed into the shipbreaking industry that is choking the landscape and squeezing life out of its natural resources as well as its workers and the people who live here. A welcome sign that proudly proclaims, “Safety is Our Motto, Welcome to Alang,” is juxtaposed with shot after shot of dismal conditions that depict bare survival. The irony cannot be more obvious. The numbers speak for themselves - 9000 tons of steel, with temperatures reaching 50 degrees Celsius in an inferno like environment. It takes 500 workers and 6 months for a ship to disappear while the workers make just a few dollars a day. Even as this industry offers employment to thousands of migrant laborers, the heavy price paid is apparent in the stories they tell and in the missing corpses. The interviews with the gas cutters who are the elite workers in this band, illustrate their minimal knowledge of operations, with instinct and luck playing a big role in how they approach this dangerous task. With no formal training or degrees in naval architecture or engineering, these workers perform their duties with uncleared gas lines blindly, by what the narrative voice terms “engineering in reverse”. Through the story of Mittu, a young boy, we see the broken dreams that fill the lives of these workers. He hopes that the measly wages will bring happiness to the family he left behind, even as he laments the death of a brother in the same industry. The ironies, the juxtapositions, the montage of images of splintering steel hulls is stark, unnerving and sets the stage for an industry that thrives on the economies of low wages for unskilled migrant labor. Dr. Ritu Saksena is the Associate Director for the Center for South Asian and Middle Eastern Studies and an Adjunct Assistant Professor in the Program in Comparative and World Literature at the University of Illinois, Urbana-Champaign. She has taught several courses on World Literature and Global Cinema,. Her research interests include Postcolonialism, Cinema Studies and South Asian studies. 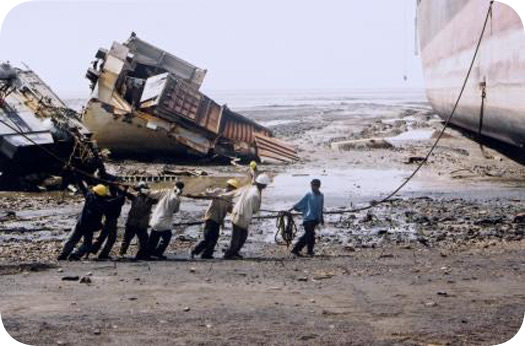 http://www.wesjones.com/shipbreakers.htm William Langewiesche is a correspondent for The Atlantic. Rousmaniere, Peter (2007). "Shipbreaking in the Developing World: Problems and Prospects". International Journal of Occupational and Environmental Health. http://www.ijoeh.com/index.php/ijoeh/article/view/414/356.